Pink Lemonade : Splash into Summer Book Giveaway!! 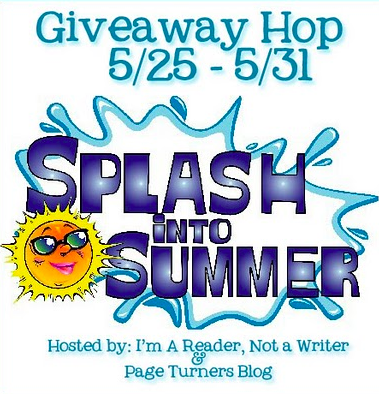 Splash into Summer Book Giveaway!! The Splash Into Summer Giveaway Hop is hosted by I Am A Reader, Not A Writer & Page Turners. It will take place from May 25th to 31st. In connection with this hop, I am giving away copies of J'ADORE NEW YORK along with a surprise vintage book from my personal collection. To enter, become a follower of this blog, leave a comment below. For additional entries, follow me on Twitter. There are many other giveaways so please visit the other blogs as well. Winners will be announced on May 31st. Good luck!! Oh how I would love a copy of your book. Sounds like a perfect summer read! I'm so glad I found your blog. It looks so fun! Please count me in. I love adding new books to my collection!! Would love to win! I'm a GFC follower. Thanks for the awesome giveaway! I am new follower. Thanks for the giveaway! I am a new follower. Oh, I am SO going to read your book whether I win or not..sounds like something j'adore! Thanks for the giveaway! Your blog looks lovely, I subscribed with GFC (Judith H). I've got a giveaway on my blog (not in this blog hop) if you're interested. Great giveaway! (I hope it's international - I didn't see it on the post) Your book sounds like a great poolside / beach / summer read! Please include me in the contest. My name is Maria Elena Abraham (mariaelenaabraham at gmail dot com) and I'm following on twitter (user name: imjustmea). Hi sweetie-pie. Just wanted to say happy-almost-weekend ~ what a perfect time for people to read your book if they haven't already ... while relaxing on a beach somewhere hopefully! I truly enjoyed it so much and am waiting with baited breath for the next! Kisses! Beautiful website. I love it! I am a new follower on GFC and on Twitter. You books sounds like a really good reading during summer, thanks for making the giveaway international! I'm a GFC follower: linda2060. I'm a GFC follower. I follow you on twitter as @dien_da. Would love a good summer read! Just subscribed to the blog, and I follow you on Twitter with the handle @sweetkeet. Hope I win! Sounds like a wonderful book! Best of luck with it. Love the giveaway! Best of luck with the book. I follow you on Twitter as @sweetkeet. Hope I win - would love to read this. I'd love to win a copy of your book. I am a new follower on GFC. I've read your book. FANTASTIC! Would love another signed copy to give to my best friend's 30th coming up. It'd be the most priceless gift in the world! We have shared so many memories together in New York...it is our favorite city in the world! Thank for the giveaway. I would love to win your book. Thanks for the giveaway! I am a GFC follower(Sophia). I am a new follower via google friend connect (Jackie). Thanks so much! J'Adore New York sounds like a wonderful read! I am a new GFC and Twitter follower. Thanks for the givaway, the prize sounds really interesting. Thank you for the giveaway! =) Please count me in. Following and entering for the contest. Totally awesome - My wife, daughter and I are always looking for a new reader to explore and tell our friends about. I would love a copy of your book! :) Sounds like a good pool book. I follow through GFC as aloveforbooks. Came along via the blog hop. I think my wife would love this book! Your blog is fabulous! Thanks for the giveaway. thanks for the giveaway!sounds interesting! I'm a new GFC follower under Aline Tobing. I follow this blog via Google Friend Connect. J'adore New York sounds like an awesome book! Great summer giveaway-thanks for the chance to win! !